Don Milne here, ready to go again on ROADTRIP-'62 ™ . We're well into the first of our ROADTRIP-'62 ™ routes, traveling US-23. We're finally in the second state of the trip, at Fostoria, Ohio. We start the day six days down the road from the northern beginning point at Mackinaw City, Michigan. Today we'll reach up to heaven and go underground. And, as usual, we'll find new 1962 things to do. As we continue this virtual roadtrip, I want to remind you that if you see anything you like, get out on the road and enjoy it in person. A virtual roadtrip may be fun, but there's nothing like the real thing! And, at any time, click on an underlined word below to learn more about the places on the trip. Time to buckle up the seat belt again and go! Just south of Fostoria we cross US-224. How many US routes does that make now; 13 I think? At our next stop in Carey, Ohio we can tour a religious shrine: The National Shrine of Our Lady of Consolation (or St. Mary's Shrine). Just two blocks west of US-23, it was established as a shrine in the Original Shrine Church across the street from the Basilica, in 1875. At that date a replica statue of Mary was commissioned and arrived from Luxembourg. Devotion to Mary under the title Our Lady of Consolation dates back to the second century and in 1652, after a plague in Luxembourg, the Pope established a confraternity. The devotion eventually spread to the United States, where in 1912 Franciscan Friars moved permanently to Carey to care for the countless pilgrims who visit the Shrine. Cures and healings continue to take place to the present day through the intercession of Our Lady of Consolation. Three blocks west is a park with a memorial altar dedicated in 1957 and the 23 stations of the cross. Before we leave Carey, let's head 4 miles west of town on Ohio-568. Here we find Indian Trail Caverns, featuring the largest cave network in Ohio. Part of the caverns has been filmed for a special on the Discovery Channel, and there is ongoing archaeological research because of the large number of animal bones found here: over ten thousand animal specimens and artifacts so far! Stone tools from prehistoric peoples of the region have also been found. And, there's the rare cave feature of Nature's Skylight: a hole in the ceiling that lets in the sunlight. The caverns were first opened in 1927, so we could have seen them in 1962 and we will now. I'll let the tour guide tell us more. We leave town on Ohio-199, because it is on the old route of US-23 in 1962, whereas today's US-23 leaves on a freeway that was not here then. In fact, all day we will be traveling the old road but very close to the new road. At Upper Sandusky, we reach one of the oldest cross-country highway routes. The Lincoln Highway was established before the US routes were numbered, in 1915. It is commemorated here with a brick "LH" marker and historical marker sign. Part of it is still a brick street only 16 feet wide. Another part was designated as US-30N in 1962. Just north of town we crossed the current US-30 on its freeway. The Lincoln Highway was championed by Carl Fisher, the man also responsible for the Indianapolis Motor Speedway and Miami Beach, together with Frank Seiberling and Henry Joy. They envisioned a hard-surfaced road from coast to coast, New York to San Francisco. I guess that will make another great ROADTRIP-'62 ™ . I'm also stopping at another early transportation site near town. Head 4 miles east on County Road 62 and we come to the Swartz covered bridge. If you're not visiting it yourself, you can look over this fine collection of photos by Gregory S. Hamilton. Bridges used to be covered with wood to help protect the structural wood members from the weather, with a cover that could be painted and/or replaced as needed. This one dates from 1879 and is over a branch of the Sandusky River. There is also a mill that was constructed for the Wyandot Indians by the United States government in 1821. It was later rebuilt like a covered bridge and was given to the State of Ohio in 1943. But we've seen enough mills for awhile so I'm taking a pass on this one. The Wyandot County Museum was built in 1852 and opened as a museum in 1962, so we could stop there. This small museum is home to artifacts and documents relating to the history of Wyandot County, and includes a One Room Schoolhouse that was also brought to the Museum grounds in the 1960s. This building features lunch pails from about 1880-1910, wooden desks, and old maps. For anyone interested in bird watching, Killdeer Plains Wildlife Area is located southwest of town. The area is part of an ancient tall grass prairie and restoration of the area was begun in 1952. A 1,700-acre waterfowl refuge was established in 1956, which has since been expanded and provides a resting area for migrant waterfowl. The area now has over 8,000 acres of prairie, marsh and woods. You may even spot a bald eagle out there. When we return to old US-23, we will have to run right along side it's newer freeway for a ways, as they built the freeway on top of the old road again. We finally break off the freeway onto Ohio-423, just inside Marion County. Marion, Ohio was the hometown of our 29th President, Warren G. Harding. Here we'll stop at both his home and tomb. The home includes many furnishings from the period of his 1920 campaign, known as the "front porch campaign." It acquired this name because of Harding liked to give speeches from the front porch, and the former campaign headquarters building is also on the property. This building contains memorabilia from Harding's life and campaign. Ohio has been home to more U.S. presidents than any other state; a total of 8. Others are: Rutherford B. Hayes, James A. Garfield, Ulysses S. Grant, William Howard Taft, William McKinley, Benjamin Harrison, and William Henry Harrison. The Harding Memorial, with the tombs of President and Mrs. Harding, is on old US-23 just south of downtown. It is a white marble building looking sort of like a round Greek temple and is open from dawn to dusk. After seeing these historical sites, it's lunchtime and I could use a good root beer. Stewart's Root Beer Stand back at the north edge of Marion seems the perfect place. It was built in the 1930s and still has car hops to bring your food so you can hang the tray on the car window. Modern popcorn equipment - no air poppers in 1962! After lunch it’s back to downtown, where I’m going to visit the Wyandot Popcorn Museum. This is part of the Marion County Museum of History, and you can see fifty popcorn popping machines, concession trucks and other artifacts related to popcorn. Though most of them are very old, the museum's best restored wagon was still in use in 1962. It is a 1915 Cretors Model D with everything working, including the peanut roaster. The museum has only been here since 1982 but with equipment from 1962 and free popcorn, how can I resist? And Marion has something else related to popcorn: Cracker Jack. While it is not the home of the invention of this crunchy snack, Cracker Jack were made in Marion from 1998-2007. This is where they once put those little surprises in every box and bag! The prizes are so popular that there is even a Cracker Jack Collector's Association. So in honor of this 100-year old snack, let's buy a bag now for munching along the highway. As we leave downtown, we can see a shiny new 1963 Buick on an unusual display. Yes, it's 1962, but new car models used to be released in the September before the model year, so here it is. You know, I need to stop for one more road snack. Shirk's Homemade Candies has been making handcrafted candies since 1932. Today they specialize in hand-dipped chocolates. But the business was originally built on carmels and carmel popcorn. They eventually sold the carmel corn recipe to the Wyandot Popcorn Company, whose factory once made Cracker Jack, another version of carmel popcorn. The Nut & Chewy Assortment looks like just my style: milk chocolate, dark chocolate and pink coating on all kinds of crunchy stuff including cashews, pecans, coconut, caramels, cereals and chips. And, for those of you keeping track of US-numbered highway crossings, we also cross the other half of the Lincoln Highway as we leave town. At Upper Sandusky we crossed old US-30N and at Marion we cross old US-30S, which was once known as the Harding Way. If you remember the 1980s, you asked where's Waldo? Right here, it seems, as we drive through the small town of Waldo, Ohio. (I know it's not a 1962 thing, but I couldn't resist.) The town is famous for one thing though, the G & R Tavern and it's Fried Bologna Sandwich: a half inch slab of bologna fried and served with onions, cheese and pickles on a bun! It's not mealtime now and I don't know how long they've been serving the sandwich, or else I would give it a try. Instead, we'll just go through downtown and then rejoin modern US-23 again just south of town. Keep a close eye out for something that used to be on barns all over the country in 1962: a Mail Pouch Tobacco sign. The whole side of a barn was painted as a billboard and there is one we can see while driving southbound on US-23. Here it is, just south of Ohio-229, and it’s beginning to look a bit broken down. As rare as these are nowadays, we will actually pass by some more on this trip. After World War II, many of the Mail Pouch barns were painted by Harley Warrick, who lived in Ohio. That may account for why we’ll see several along US-23. The Highway Beautification Act of 1965 began the restriction of advertisements near highways but, exempted Mail Pouch barns as they were deemed historic landmarks. 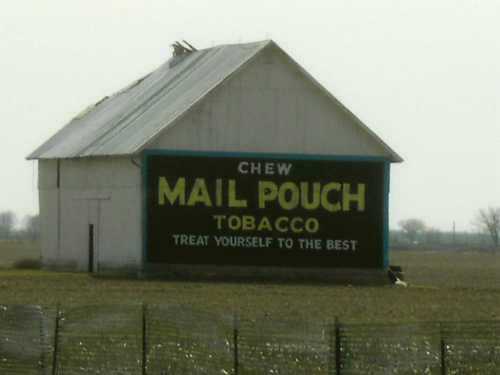 The Mail Pouch Tobacco folks decided to quit using barn advertiseing in 1992 when Warrick retired. Barn signs were very common 50 years ago, especially for advertising tobacco and tourist sites. Some of the more famous sites that used them were Rock City in Chattanooga, Tennessee and Meramac Caverns in Stanton, Missouri. They were also used for local businesses: I recall one near my home town for a United Van Lines mover. About six miles south of Waldo, a good place to stop for a picnic lunch (if I could have waited that long) would have been Delaware Reservoir State Park. It's right behind the high wall of dirt that forms part of the reservoir's levee on the left. Delaware Lake was created by the U.S. Army Corps of Engineers in 1951, when they completed construction of a flood control dam, and the state park opened that same year. Maybe next time I'll have a 1962 picnic at the park, but today I'm just hiking along the lake and through the woods. If you're into fishing, both largemouth and smallmouth bass are in the lake. In the early 1800s, a route near present US-23 was well-used by travelers to and from Lake Erie, so we're on a very old road here. And Delaware, Ohio seems to have history everywhere you look! One historic specialty here is old neon signs. Some of the more interesting ones I found, all downtown, are a shoe repair store, the Bianchi Grill, the Strand Theatre, Nectar Candyland and Bun's Restaurant. Bun's sign actually hangs right over the middle of the street and has since at least 1947: I wonder how they got permission for that? I'd like to look for gasoline here, but the only old station I saw was closed. There is an old Pure gas station at the corner of Sandusky Street and Lincoln Street, with its distinctive blue tile roof. Gas stations were often of distinctive architecture, to make the brand stand out in a day when gasoline was not so much the commodity it is today. Even today, if you know a bit you can spot old gas stations and know their original brand just from the architecture. Of course, few are still used as gas stations because the selling of gas has also changed. A gas station in 1962 almost always included automobile repair bays, whereas now they almost always include a convenience store. They also used to give away highway maps for free with the brand prominently on the cover, whereas now you have to buy them and they are the same maps you can get at Wal Mart. Two more US routes cross through town, US-42 and US-36. If you head west on US-36 to Hannibal, Missouri, you can stop at the caverns Mark Twain made famous in Tom Sawyer. But we saw some caverns today and seven miles south of town here we could see the Olentangy Indian Caverns tomorrow. We will also drive by a monument at the birthplace of President Rutherford B. Hayes: the house has been demolished. I think I'll see a movie in a historic theatre this afternoon: the Strand Theatre, built in 1916, is still open. Of course, you won't see any 1962 movies like "To Kill A Mockingbird" or "The Miracle Worker." Like many small town theatres, the Strand almost closed up a few years ago. It was purchased by Ohio Wesleyan University in 2002 and later transferred to a nonprofit organization. So maybe I shouldn't say no old movies, as the university sometimes hosts special old movie events. Anyway, it's a great place to see any movie, with great art deco architecture including some tile floors, and an old theatre organ (though not the original one). We should have dinner before we head out to the observatory, and there are plenty of interesting old places in Delaware. Bun's Restaurant, established 1889, with it's neon sign of course, serves a mean ham loaf and sweet potato fries. The Hamburger Inn, opened in 1932, is naturally a good choice for burgers, and at meal times sometimes has people waiting outdoors. The Brown Jug, dating from 1946, has classic dinner items like steak and seafood. And Gulla's Hot Dogs, while only downtown since 2006, serves the same unique fare as their original 1929 location in Bellaire, Ohio, including such items as fries-n-gravy and deep-fried pickles in addition to hotdogs. I'm giving Bun's a try tonight as I just love their sign. And after dinner, we might even find a good older motel, as there are several candidates around town. Well, tonight we are not watching TV at the motel. Instead we’re going to an observatory. Ohio Weslyan University operates the Perkins Observatory just a few miles south of Delaware, and they have public programs at 8pm. They are the only observatory in Ohio which conducts public programs and they often sell out, so call and get your tickets ahead. The tour presents the current scientific understanding of astronomy and physics, using a 32-inch telescope. And some nights you even get to use the telescope! The original 69-inch telescope, completed in 1931, is on display though not in use. Here's looking at the stars!